Solidification and Solid-State Transformations of Metals and Alloys describes solidification and the industrial problems presented when manufacturing structural parts by casting, or semi-products for forging, in order to obtain large, flat or specifically shaped parts. Solidification follows the nucleation and growth model, which will also be applied in solid-state transformations, such as those taking place because of changes in solubility and allotropy or changes produced by recrystallization. It also explains the heat treatments that, through controlled heating, holding and cooling, allow the metals to have specific structures and properties. It also describes the correct interpretation of phase diagrams so the reader can comprehend the behaviour of iron, aluminium, copper, lead, tin, nickel, titanium, etc. and the alloys between them or with other metallic or metalloid elements. 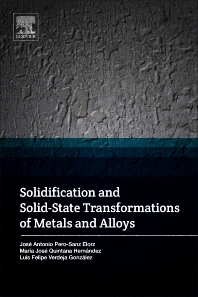 This book can be used by graduate and undergraduate students, as well as physicists, chemists and engineers who wish to study the subject of Metallic Materials and Physical Metallurgy, specifically industrial applications where casting of metals and alloys, as well as heat treatments are relevant to the quality assurance of manufacturing processes. It will be especially useful for readers with little to no knowledge on the subject, and who are looking for a book that addresses the fundamentals of manufacturing, treatment and properties of metals and alloys. María José Quintana, PhD has an European Doctorate in Science and Technology of Materials from the University of Oviedo (Spain), and is a professor and researcher in the Materials group in the Panamerican University (Mexico). Dr. Quintana works on subjects of molding, thermomechanical treatments of steels, superplasticity of metals, microscopy and mechanical properties of materials, among others. The late José Antonio Pero-Sanz, PhD (2012) had a Doctorate in Engineering from the University of Barcelona (Spain). He was a founding member of the International Metallographic Society (USA), a fellow of the Institute of Materials, Minerals and Mining (UK) and Membre d'Honneur of the Société Française de Métallurgie et des Matériaux. He consulted on Physical Metallurgy matters for the United Nations Industrial Development Organization (UNIDO) as well as for Arcelor Mittal-Europe and was a member of the Conseil Scientifique des Usines Renault. Dr. Pero-Sanz was the Head of Research for more than 30 years of the Materials group in the Oviedo and Madrid Schools of Mines. Luis Felipe Verdeja, PhD has a Doctorate in Chemical Sciences from the University of Oviedo (Spain), and is a professor of Materials Science in the University of Oviedo as well as Head of the Siderurgy, Metals and Materials Group (Sid-Met-Mat). Professor Verdeja is the author of various books such as Metalurgia Extractiva and Materiales Refractarios y Cerámicos (in both Spanish and English versions: Refractory and Ceramic Materials). His work is related to steels and aids for the industry, such as refractories and other non-metallic materials. Excellent book about the fundamentals of materials science. This is an extraordinary book written by three Spanish authors over a period of about 50 years. The second half of the 20th century was a golden age for physical metallurgy – dislocation theory, alloy equilibrium diagrams, nuclear power, high temperature alloys, strength to weight ratio alloys. The book is intended for undergraduate students of physical metallurgy, chemistry, and engineering. It considers all fundamentals that determine the close relationship between structure and properties and specific applications of metals and alloys. practical consequences such as segregation, soundness, hot tearing, and castability. This is where the book gets closest to industrial metallurgy and economic production. suggest one of the contributors worked on transformation diagrams for low alloy steels. This is a readable book with well-chosen illustrations and examples.